The Centers for Disease Control and Prevention is reporting an uptick in seasonal influenza across the United States. 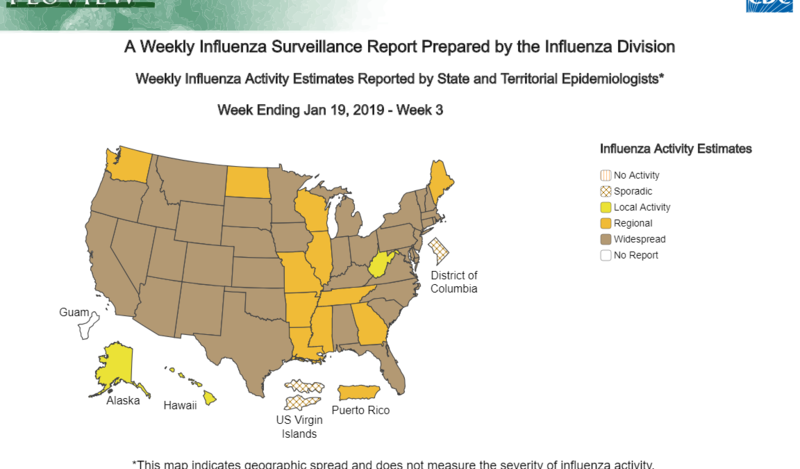 According to this week’s FluView report, seasonal influenza activity increased nationally and most states are reporting widespread flu activity. CDC also reported another three flu-associated pediatric deaths. H1N1 viruses have been the most commonly identified flu viruses nationally. However, H3N2 viruses have predominated in the southeastern region of the United States. Influenza-like Illness Surveillance: For the week ending January 19 (week 3), the proportion of people seeing their health care provider for influenza-like illness (ILI) increased from 3.1 percent to 3.3 percent, which is above the national baseline of 2.2 percent. All 10 regions reported a proportion of outpatient visits for ILI at or above their region-specific baseline level. For comparison purposes, over the past five flu seasons, the peak percent of visits due to ILI has ranged between 3.6 percent (2015-2016) and 7.5 percent (2017-2018). Additional ILINet data, including national, regional, and select state-level data for the current and previous seasons, can be found at http://gis.cdc.gov/grasp/fluview/fluportaldashboard.html. Mortality Surveillance: The proportion of deaths attributed to pneumonia and influenza (P&I) was 7.2 percent during the week ending January 12, 2019 (week 2). This percentage is above the epidemic threshold of 7.1% for week 2 in the National Center for Health Statistics (NCHS) Mortality Surveillance System. P&I data for week 1 backfilled to 7.0 percent, which is at the epidemic threshold for that week. P&I has now been at or above the epidemic threshold for 2 weeks so far this season.